Exhuming Civil War veterans' bodies were common. Sometimes the military removed bodies. Sometimes families re-interred their fallen soldier. So where was the final resting place of your Civil War ancestor? 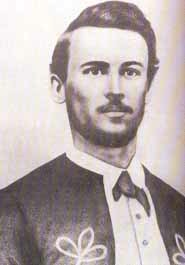 The last battle of the civil war, the Battle of Palmito Ranch (Texas) determined the fate of John J. Williams. 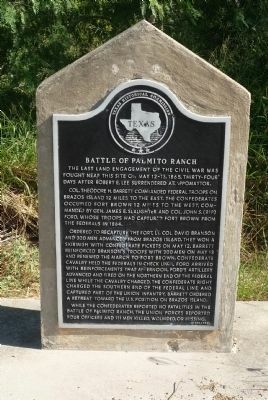 One hundred eighteen (1800) US soldiers fell in the Battle of Palmito Ranch. The last was Pvt. Williams. In the 22 June 1865 Jay Torch Light newspaper, it was reported that Sara Jane Williams had received a letter on the 21st of May confirming her husband's death. The Jay Torch Light newspaper reprinted the letter Sara Jane Williams received on May 21. "The 'Rebal' ball struck him just right above the right eye killing him instantly." John [J.] Williams was originally buried at Ft. Brown Cemetery near the battle site. After the establishment of the Alexandria National Cemetery in Louisiana, Williams' remains were exhumed and interred there. 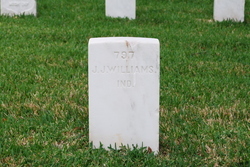 His simple headstone "797 J.J. Williams, IND" still stands, even though the Alexandria National Cemetery was not to be the final resting place of Pvt. Williams. His family eventually chose to exhume his body once again and bury him in the family cemetery in Jay County, Indiana. The cemetery is now a National Historical Site. Letter to Sara Jane Williams in the Jay Torch Light Newspaper, 22, Jun 1865. Also printed on his Jay County biography. 140th anniversary of Williams death, 14 May, Jay County Museum of the Soldier sponsored an anniversary ceremony. The headstone was provided by the Veterans Administration. Photo of the headstone was provided by the Museum of the Soldier. Wow, I've never heard of three burials like that! What a great story, thanks for sharing. I have ancestors who served in the Civil War from Randolph and Jay counties in Indiana! Thanks Lisa for stopping by. Jay County has an abundance on its Civil War soldiers. Enjoy researching!